Smoking or the consumption of drugs is not permitted in the caravan at any time. Animals are not permitted in the caravan at any time. Ask please, exceptions can be made. The hirer shall ensure that the caravan is securely locked when not in use. 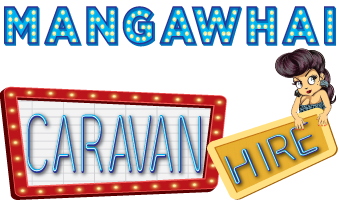 The hirer shall advise Mangawhai Caravans of the whereabouts of the caravan at all times. The Hirer shall under no circumstances whatsoever move the caravan without prior permission. The hirer shall not sublet the caravan under any circumstances nor use the caravan for any unlawful purpose. The hirer shall leave the caravan clean and tidy and clear of all rubbish and possessions at the end of the hire term or pay a $40 cleaning cost by agreement. Any breach of the above terms and conditions will result in loss of the bond.